Europol in the United States — Beginning of an EU-U.S. Police Merger? Europol, the burgeoning police and intelligence agency of the European Union, has many people in Europe concerned about its continuously expanding mission and powers (see here and here). Now the agency appears to be getting ready to extend its reach into the United States in new ways, as part of the Transatlantic Trade and Investment Partnership (TTIP) being promoted by President Obama and a powerful coalition (see here and here ) of Wall Street one-worlders and globalist corporate executives. The sparse reportage of this important development in EU-U.S. relations left unmentioned the fact that Europol, like so many of the EU’s institutions, has incrementally taken on increased powers, with the European Commission always citing some crisis or exigency allegedly requiring more centralized police authority. The EU’s steady erosion of the independence and sovereignty of its member states is not occurring by chance. As The New American has previously reported in many articles (see articles listed below), the architects of the Common Market (as the EU was known in one of its earliest incarnations) insisted from the start that the “project” would never evolve into a central government or in any way compromise the sovereignty of the nations involved. All the while, the same designers — as their correspondence and private speeches and communications show — were working assiduously to create a supranational federal government that would completely override the nation states of Europe. With the conclusion of the Lisbon Treaty, the people of the European Union were tricked, bribed, browbeaten, and cajoled into jettisoning almost every remaining vestige of sovereignty. In 1974, CFR member Richard N. Gardner penned a signal article in the CFR journal Foreign Affairs entitled “The Hard Road to World Order.” Since hopes for “instant world government” under the United Nations had proven illusory, he wrote, the best hope for building “the house of world order” lay in a longrange “end run around national sovereignty, eroding it piece by piece.” This could best be done, he noted, on an ad hoc basis with treaties and international “arrangements” — on environment, trade, security, etc. — that could later be brought within “the central institutions of the U.N. system.” Gardner, now a professor emeritus of law at Columbia University, served in ambassadorial and diplomatic posts for Presidents Kennedy, Johnson, Carter, and Clinton. The Council on Foreign Relations has been pursuing that end-run strategy around national sovereignty — through both Republican and Democrat administrations — for many decades now. In a 2006 op-ed entitled “State sovereignty must be altered in globalized era,” CFR President Richard Haass argued that “in the age of globalization, states should give up some sovereignty to world bodies.” The CFR chief claimed that “sovereignty is not only becoming weaker in reality, but that it needs to become weaker.” Haass and his fellow one-worlders in the CFR globalist cabal are now pushing to destroy U.S. sovereignty in the same way that the EU has all but completely destroyed the national sovereignty of its member states. The primary vehicle currently being promoted by the CFR and the Obama administration to entangle the United States in the EU project is the Transatlantic Trade and Investment Partnership (TTIP). President Obama is calling on Congress to give him “fast track” Trade Promotion Authority that would enable him to push the TTIP through Congress with little or no debate and no amendments. President Obama spoke at Planned Parenthood’s annual gala April 26, using the platform to affirm his continued support of the abortion giant, while attacking states that have worked to protect the unborn and their mothers by passing legislation to defund Planned Parenthood and other abortion providers. Significantly, Obama is the first sitting president to address the so-called “family planning” organization. Just as significant is the fact that nowhere in Obama’s lengthy speech could he bring himself to utter the word “abortion,” although Planned Parenthood is responsible for 40 percent of the murderous procedures done in the United States, and abortion makes up a significant portion of its revenue stream. And — without speaking the abhorrent “A” word — the president noted that “somewhere there’s a young woman starting a career who, because of you, is able to decide for herself when she wants to start a family.” By which he meant that Planned Parenthood has been only too willing to kill the pre-born babies of countless women who decided that, for whatever reason, a baby would be an unnecessary inconvenience. Add to that the ACA’s infamous contraception mandate rider that would require businesses to provide free contraception — including abortion-inducing drugs — to their employees, and Planned Parenthood is set to add more billions to the hundred of millions in federal tax dollars it receives. After the president’s patronizing address, Planned Parenthood’s head, Cecile Richards, returned the favor, crowing that “President Obama has done more than any president in history for women’s health and rights” — even while she conceded that Planned Parenthood faces “unprecedented attacks” from states that have grown tired of pouring hundreds of millions of dollars into the coffers of the abortion business. Predictably, during his speech Obama made no mention of the alarming testimony offered recently by a Planned Parenthood representative during a Florida legislative session, in which she refused to condemn what has euphemistically been termed “post-birth abortion” — the killing of a baby moments or more after he or she has been successfully delivered by a mother. Nor did the president make any allusion to the high-profile trial of Philadelphia’s “House of Horrors” abortionist Kermit Gosnell, charged with the “post abortion” murders of several babies born alive at his climic. A grand jury report laid out the horrific conditions inside Gosnell’s clinic, and speculated that hundreds of newborns were murdered over the years by Gosnell and his workers. After Officer Pedro Serrano decided to testify in federal court about what he sees as wrongdoing within the New York Police Department, a rat sticker appeared on his locker. 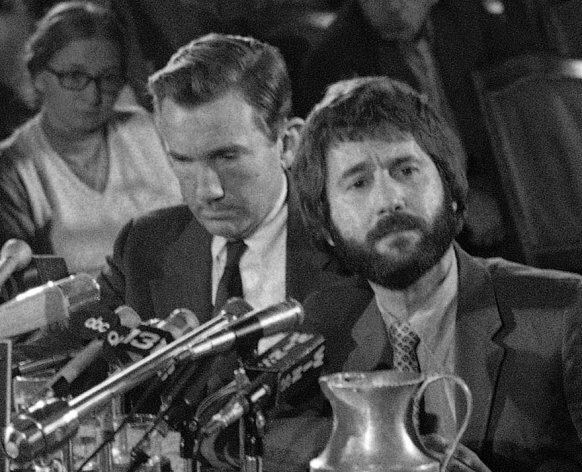 Associated Press/Jim Wells, File – In this Dec. 13, 1971 file photo, New York City Detective Frank Serpico, right, sits beside his attorney, Ramsey Clark, in New York, during the Knapp Commission hearings. But starting with legendary whistle-blower Frank Serpico in the 1970s, corruption scandals large and small have exposed a clannish culture that critics say encourages police officers to turn a blind eye to wrongdoing and never question authority — or else face harassment by peers and punishment by superiors. As a plainclothes officer, Serpico was labeled a traitor for refusing payoffs and reporting corruption. On Feb. 3, 1971, he was shot in the face during a drug raid; he says other officers purposely failed to back him up. He recovered and testified before the Knapp Commission — a story etched in popular culture by a hit movie starring Al Pacino. In the early 1990s, an internal affairs investigator who pursued drug-dealing officers was blackballed by his commanders before an independent investigation by the Mollen Commission proved him right. And the 1997 police assault of Abner Louima resulted in charges against officers who kept quiet because of a so-called blue wall of silence — an unspoken code among the rank-and-file to never “rat” on each other. Both Serrano and Polanco said they made stops they didn’t think were right as a result. Schoolcraft, who didn’t appear in court because he has filed his own federal suit, was taken to a psychiatric ward in 2009 by his superiors, he says against his will. He remains suspended. For example, he says, he never saw his commanding officer until word got out about his quota allegations — then the official was personally checking Serrano’s shift paperwork. He says he was forced to drive around with a sergeant and issue summonses and stop people until he brought up his numbers. Even after his numbers improved, his evaluations didn’t. And he claimed he was forced to come in during a massive snowstorm even though he was nearly in a car accident. When asked whether Serrano’s complaints were considered punishment, several other officers who testified said no — it’s just part of the job. Serpico, who now lives in upstate New York, still feels like an outsider to the police. He says he’s there to listen when fellow whistle-blowers reach out. Authorities in the Northern California town of Valley Springs are searching for an intruder who killed a 9-year-old girl at her house. The Calaveras County Sheriff’s office said Saturday that the man was considered armed and dangerous, and authorities are warning residents in the country town to lock their doors. The office declined to release details on the slaying. NBC’s Sacramento affiliate KCRA reported the victim’s 12-year-old brother encountered an intruder in his home and saw the man run away. The boy went to check on his sister and found she had been stabbed. The girl was later pronounced dead at a hospital. Valley Springs is a town of about 3,500 some 60 miles southeast of Sacramento. Numerous charges have been filed against a burglary suspect who allegedly punched a police dog that helped apprehend him in northern New Jersey. Clifton police tell The Record of Woodland Park that 22-year-old Angel Mendez ran from police on Friday and was found a short time later hiding under the front porch of a home. Mendez allegedly punched the police dog as he was being arrested, and the canine bit Mendez on the upper thigh. Mendez, who has no known address, faces four counts of burglary. He’s also charged with aggravated assault of a police dog, resisting arrest and obstruction of justice. A telephone number for Mendez could not be found Saturday, and it was not known if he has retained an attorney. Judicial Watch, the Washington watchdog which is known for tracking down and trying to stamp out government corruption, has issued a report revealing that the U.S. Department of Agriculture is working with the Mexican government to promote the U.S. food stamp program to illegal aliens. “The revelation that the USDA is actively working with the Mexican government to promote food stamps for illegal aliens should have a direct impact on the fact of the immigration bill now being debated in Congress,” said Tom Fitton, the president of the organization. “These disclosures further confirm the fact that the Obama administration cannot be trusted to protect our borders or enforce our immigration laws. And the coordination with a foreign government to attack the policies of an American state is contemptible,” he said. Last year, Judicial Watch reported that Sen. Jeff Sessions, R-Ala., wrote to USDA chief Tom Vilsack asking questions about the Obama’s administration partnership with Mexican officials to hand out taxpayer-paid benefits to those illegally in the U.S.
One document was an email to Jose Vincente and Borjon Lopez-Coterilla, in the Mexican Embassy, from January 2012. It followed a request from the Mexican Embassy that the Obama administration prevent Kansas from making a proposed change in a food stamp procedure that would limit financial help to illegals. Judicial Watch also showed the USDA asked Mexico for permission to draft a letter to consulates to encourage Mexican employees to participate in training intended to promote enrollment in the tax benefits program. Alcoholism Disability Claim: Can Fired Officer Win this $6 Million Lawsuit? Alcoholism disability claim: An Oregon policeman says he was fired due to alcoholism, which he’s claims is illegal under the Americans with Disabilities Act. A police officer fired for driving drunk in an unmarked police car while off-duty has filed a $6 million lawsuit against the city of Gresham, the police chief and others, alleging his rights were violated under the Americans with Disabilities Act. The lawsuit filed in Portland alleged the officer, Jason Servo, was suffering from alcoholism, a recognized disability under the act, and shouldn’t have been dismissed. The suit also alleged Servo was denied due process, and the police union failed to represent him adequately. “Just as with any type of disability or disease, they should have made some kind of effort to accommodate that, or some kind of effort to work with him, and not simply sever all ties,” said Shawn Kollie, one of Servo’s attorneys. Police Chief Craig Junginger was out of the office Friday. City spokeswoman Laura Shepard said officials would not discuss the case because their policy is to not talk about pending litigation. Servo, 43, was arrested in January 2011 after he crashed into a ditch while off-duty. The lawsuit said that Servo, a detective who was the department’s lead firearms instructor, had taken the police vehicle to a firearms training session in the nearby city of Troutdale. He later joined fellow officers for dinner and drinks. “This was a common practice among (Gresham) officers and had become an inherent part of the culture,” according to the lawsuit filed late Thursday. Servo was alone when his vehicle veered into a ditch and he was not hurt. Though Servo refused to take breath or field sobriety tests, the Clackamas County sheriff’s deputy who arrested him later testified before the state Department of Public Safety Standards and Training that Servo was probably one of the top 10 most intoxicated people he had arrested in almost 15 years of drunken-driving investigations. Two months after the accident, Servo pleaded guilty to drunken driving and entered a diversion program. He fulfilled the program’s requirements and the DUI was dismissed. Servo also voluntarily entered an in-patient program at a Serenity Lane drug-and-alcohol treatment center, where he was diagnosed as an alcoholic. “There were times where I went home and I couldn’t get crime scenes out of my head; I went to drinking for that and there are other officers that do the same thing,” Servo said Friday, adding that he has now been sober for 818 days. The lawsuit alleged the chief fired Servo to save money, ignoring the known disability of alcoholism. It could not immediately be determined how common it is for alcoholics to claim their rights have been violated under the Americans with Disabilities Act. The U.S. Equal Employment Opportunity Commission, in a fact sheet, provides an example of how an alcoholic can justly be fired, and it’s similar to the Servo case. In its example, a federal police officer is involved in an accident for which he is charged with drunken driving. About a month later, he gets a termination notice stating that his conduct makes it inappropriate for him to continue. The officer says the arrest made him realize he is an alcoholic and that he is obtaining treatment. According to the EEOC, the employer may proceed with the firing. The example, of course, is not precise because Servo’s crash happened while he was off-duty. “The ADA has provisions in it, across the board, to not require employers to subject other people to unreasonable risk to accommodate a disability,” said Bob Joondeph, executive director with Disability Rights Oregon. Joondeph said he couldn’t comment on any specifics in the Servo case, but generally accommodations for an alcoholic might include letting the worker attend Alcoholics Anonymous meetings — not allowing them to drink on the job or drive drunk. Separate from the lawsuit, Servo is appealing the standards-and-training agency’s decision to strip him of his police certification. Servo is currently working as a private investigator. 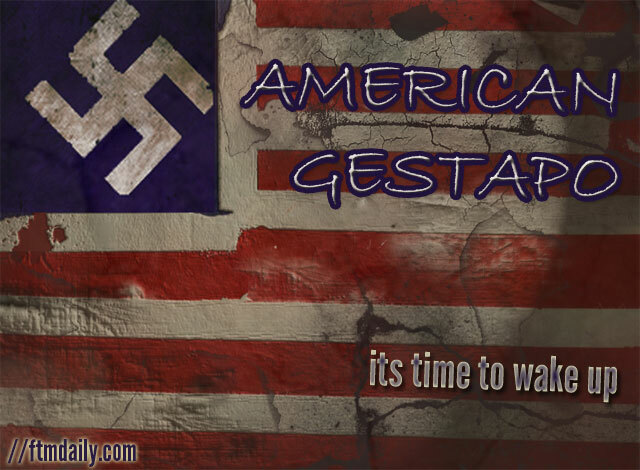 The Gestapo-like tactics that were implemented in Boston last week by the military-style police forces are just a small sign of things to come in America… including a large spike in military-style drones flying over — and spying on — American cities as well as a new influx of high definition security cameras in major U.S. cities. As we expected, the power hungry elites in Washington are using the Boston bombings to force a false choice on the American “sheeple”. And they are using the corporate-controlled media to spread their delusional attempts at a massive power grab. Which would you prefer if a “terrorist” is loose in your town? 1) Armed policemen enacting martial law in your city, imposing curfews, and conducting door-to-door searches while holding your family at gunpoint? Apparently these are the only two options that Washington is prepared to consider. This choice is entirely fabricated. Americans can say “no” to both choices. Unfortunately, with the recent passage of the unpatriotic Patriot Act and the outrageous National Defense Authorization Act of 2012, American citizens can now be detained indefinitely strictly based on suspicion. No evidence is needed and the decision cannot be questioned by the American public. After being subjected to martial law, mobs of Bostonians rushed into the streets holding American flags while chanting “U.S.A, U.S.A.” It was appalling to witness the birthplace of early revolt applaud the military-industrial complex rolling through its streets armed to the teeth. Bostonians have just had their most basic rights infringed upon. It is no jubilant matter. Any American who considers this type of police behavior commendable or even acceptable should be ashamed to call themselves a patriot. The government shakedown of Boston is a sign of things to come. In his farewell speech, highly decorated General and former U.S. President Dwight D. Eisenhower warned against the threat posed by the creeping influence of something he referred to as the “Military-Industrial Complex.” Today, that complex also includes the corporate-controlled mainstream media. 95% of the media consumed by the American people every day is framed, produced, and edited by U.S. corporations. As profit-seeking entities, these massive media conglomerates are not benevolent institutions committed to keeping you informed and safe. Instead, their reports are designed to drive more value for shareholders. If you trust the mainstream media, it is time you woke up to this reality. And if you are just waking up, don’t feel too bad. I was totally unaware of these facts until I began doing my own investigation in the wake of the tragic events of September 11, 2001. It took me three years to fully grasp what was happening to our country. It is common knowledge that the Department of Homeland Security has been preparing for combat through the purchase of instruments of war. These include: Approximately 1.6 billion hollow-point bullets, 7,000 fully automatic assault weapons, 2,700 MRAP (Mine-Resistant Ambush Protected) vehicles, and an increasing number of military-style unmanned aerial drones. Make no mistake. These are weapons of war. So, who is DHS planning on waging a war against? Less than a week after SWAT police went house to house ripping families out of their homes during broad daylight in the manhunt that ensued following the Boston bombings, other police departments have seemingly taken a police state cue and followed suit. 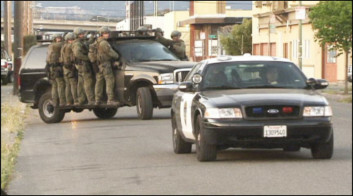 Yesterday it was reported that FBI agents and local police SWAT along with the California Highway Patrol conducted a “massive sweep” of Oakland where they barricaded several streets and closed down certain parts of the town for more than an hour. Armored vehicles and helicopters circling overhead assisted the patrols as law enforcement allegedly served warrants for drugs and weapons charges. It’s reasonable to assume that the raids partially occurred as a result of SB 140‘s recent passage, a California bill touted as one that would expedite the confiscation of “illegal” firearms from people with “serious mental illness” and criminal convictions. As we witnessed just last week during the Watertown, Mass. lockdown, a hit squad of 9000+ police could barely locate a lone unarmed 19-year-old. Regardless of the excuses listed to justify this flagrant and hideous overreach of power, it has never been more evident that the public is being acclimated to accept militarized police of all flavors as a normal part of life; and with rhetoric regarding gun control reaching fever pitch, a true police state takeover like the one seen in the Boston suburb, is liable to occur in any town overnight and without warning.